I am writing to you on the drive back to Charleston from the Morgantown Walk to End Alzhiemer's. Don't worry, NASCAR Kim is driving, not me! We had an amazing day today as well as yesterday in Lewisburg! Kaarmin and I have had a marathon 48-hour Walktober. We are completely wiped - and simultaneously so energized from all of the teams that we have walked with this weekend - all walking with one mission and one vision with love and passion. This past week marked a pretty big milestone in the history of my family. Last Wednesday my parents celebrated their 37th wedding anniversary. 37. As in 37 years. That is a really long time. But, what has shaped my life the most, my parents taught me together. You see, you don't get to 37 years out of simply luck or by default. Over the years our family has faced enormous challenges. Challenges that in the world today anyone would say it is ok to quit. But they didn't. My mom and dad built their commitment to each other and our family on a backbone made of love. So, when the going got tough, they were bound together by much more than just their wedding rings or vows. When the going got tough, their love for each other and our family got tougher. Over the years I have watched my parents sacrifice individually to protect each other and to protect our little family. In a world in which the word "selfie" is actually in the dictionary, it is sometimes easy to lose sight of that kind of love. I am not naive enoughto think my parents like each other every minute of every day. But, what my parents have sacrificed for each other in tough times, they have gotten back 10-fold in 37 years of joy, adventure, love, laughter, ME, Emily & Chris. I look at our family, now expanding to envelop W, Liz & Audrey, I can clearly see, THIS is the true meaning of life. WalkTOBER continues! We can't wait to see you this weekend in Bluefield and Wheeling! W & I are headed to Wheeling! (Rumor has it we are having dinner at Undo's the night before! Gotta carbo-load right?) Just a reminder Bank Day is Wednesday! If you are in the Charleston area on Saturday join in on the Party in Purple Zumbathon! The event benefits Walk to End Alzheimer's and will feature a variety of Zumba instructors, snacks and door prizes!! Kids are welcome too! Click here for more information! Thursday we are partnering with our friends at AARP and the Blanchette Rockefeller Neuroscience Institute to present caregiving tips and resources at WVU's Money $mart Conference. We love working with these great partners! This week we are also setting up a booth at the Senior Center Director's meeting. Senior Centers are vital to our communities, and they are great partners of ours! They play an important role in our outreach efforts about Alzheimer's and caregiving. We are finalizing our Caregiver University locations for next fall - if you are interested in helping us host Caregiver University in your community, give us a call at 800.372.3900. We are going to be rolling out some changes to registration at the Charleston Walk! While the details aren't finalized - you will want to make sure your Team Captain gets to Bank Day so you can bypass the registration line ENTIRELY!! (AH-MAZING!) Details to come! Find your Walk pictures HERE! Post-gameday we usually have a variety of food leftover from our tailgate, including veggies! After last game, we had a TON of broccoli. Which worked out perfectly, because we had a little cookout with my parents and my sister before Mountain Stage's 30th birthday concert! 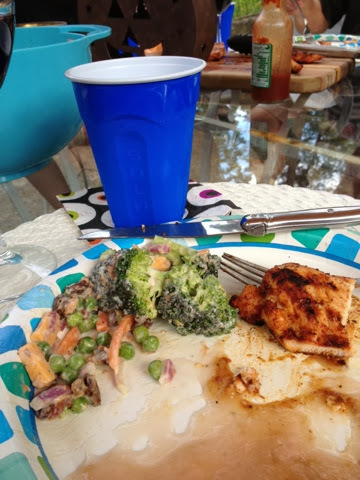 What goes perfect with outdoor eating? Broccoli salad! 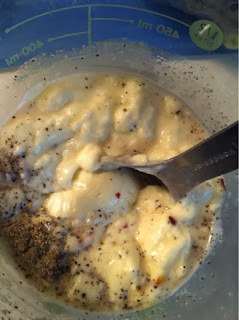 Start with the sauce: Mix 1 1/2 cups of mayo (I prefer the olive oil based mayo), with 2 tbs of white vinegar, 2 tsps. of black pepper, and a pinch of red pepper flakes. Mix and let the flavors meld together while you put together the salad part. 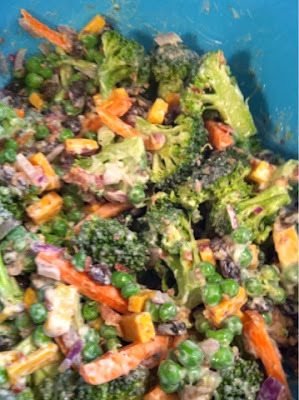 In a large bowl mix together broccoli and any combination of veggies you like! 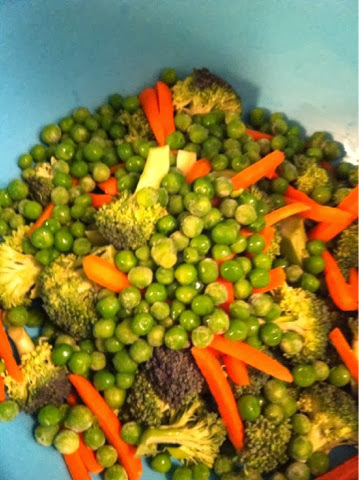 This week I went with carrots and peas. Dice a red onion and cheese! You can use shredded cheese, but there is something wonderful about chunks of cheese! 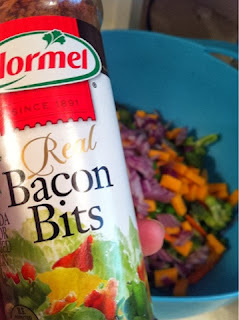 For the piece de resistance, sprinkle in chopped bacon (or in my case, bacon bits!) and raisins. Mix in your dressing, making sure to thoroughly coat everything! Last but not least! Enjoy!